Highlighting the all-district list for Italy were senior Clay Riddle who earned 1st Team honors on both sides of the ball as tight end and defensive end while senior punter Gary Escamilla earned a 1st Team nod for his kicking efforts along with a 2nd Team selection at outside linebacker. Riddle, who was an All-State defensive end as a junior, recorded over 100 tackles for the second consecutive season. Runningback Kendrick Norwood secured 1st Team honors after a collection of exciting runs to finish with 1,749 rushing yards on 213 carries for an 8.2 yard per carry average, during the regular season. Norwood recorded 19 touchdowns before heading into the playoffs, including the first rushing touchdown in the newly constructed Italy Gladiator Coliseum. Norwood ran behind a young but solid offensive line including junior guard Alex Garcia Jr., sophomore tackle Bryson May and junior center Donald Hayes III Jr. who each received 2nd Team All-District honors. Offensive linemen Adam Powell and Terry Dixon received Honorable Mention honors for their work in the trenches. Dixon was also 2nd Team on the defensive side. Hayes was 2nd Team defense as well at outside linebacker. 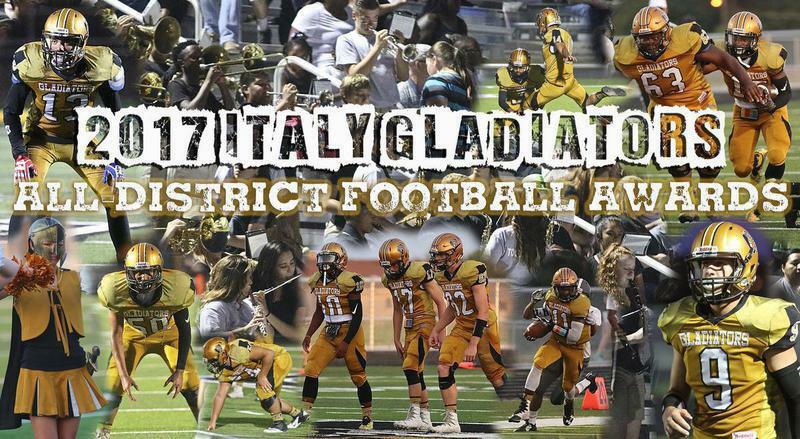 Along with Riddle, junior outside linebacker Caleb Telatnyk was the only other Gladiator to receive 1st Team honors while senior safety Devin Mapps Sr. and senior cornerback Garrett Janek received 2nd Team All-District. Mapps was also Honorable Mention on offense. Freshman Daylan Slade was awarded 2nd Team running back and Honorable Mention on defense while junior Christion Washington, despite an injury, earned 2nd Team honors on both sides of the ball. The fun-to-watch senior place-kicker Mauro Ibarra received 2nd Team All-District recognition with his golden toe. This was Italy’s third season under AD/Head Coach David Weaver who led the Gladiators to a third-straight playoff appearance. Unfortunately, Italy had to deal with the eventual 2017 State Champion Mart Panthers within their district, as well as the stout Bosqueville and Riesel teams. The Gladiators still managed to wrap their campaign with a 5-6 overall winning record while going 2-3 in district play and finishing as a Bi-District Runner-up. Running Back: #10 Kendrick Norwood – Sr. Tight End: #82 Clay Riddle – Sr.
Punter: #9 Gary Escamilla – Sr.
Running Back: #11 Daylan Slade – Fr. Fullback: #24 Christion Washington – Jr.
Guard: #54 Alex Garcia – Jr. Tackle: #56 Bryson May – So. Center: #50 Donald Hayes III – Jr.
Place-Kicker: #14 Mauro Ibarra – Sr.
#52 Adam Powell – Jr.
#63 Terry Dixon – Jr.
#1 Devin Mapps – Sr.
#7 Marcos Duarte – Jr.
End: #82 Clay Riddle – Sr.
Outside Linebacker: #13 Caleb Telatnyk – Jr. Tackle: #63 Terry Dixon – Jr.
End: #24 Christion Washington – Jr. Inside Linebacker: #50 Donald Hayes III – Jr.
Outside Linebacker: #9 Gary Escamilla – Sr.
Safety: #1 Devin Mapps – Sr. Corner: #17 Garrett Janek – Sr.
#11 Daylan Slade – Fr. #54 Alex Garcia – Jr.
#56 Bryson May – So. #21 Anthony Lusk – Sr.